Lang is just that–a fine Mississippi Delta photographer. Photographer Clay and writer T. R. Pearson recently collaborated on a new book. Title: Year of Our Lord. 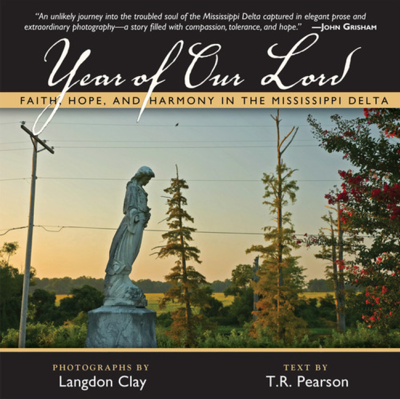 Subtitle: Faith, Hope and Harmony in the Mississippi Delta. As quoted on Mockingbird Publishing’s website about the new book, published October 2010, please read the following then order the book! Also, follow the above link to Mockingbird Publishing’s website about the book and watch the videos. They are wonderful! Lucas McCarty lives in the Mississippi Delta. He is the only white congregant in the African-American Trinity House of Prayer Holiness church. Lucas is bereft of the ability to speak due to cerebral palsy, yet he sings there in the church choir. Thus is the subject of Year of Our Lord, a portrait of courage, acceptance and grace, rendered in the lyrical prose of T.R. Pearson and the haunting photographs of Langdon Clay. Year of Our Lord, then, is an opportunity to see into another’s world, and to embrace the best of it. T.R. Pearson is the author of a dozen novels, including A Short History of a Small Place and Blue Ridge, and four works of nonfiction. He lives in Virginia. Langdon Clay was born in New York City and raised in New England. He photographs around the country and beyond for shelter magazines and coffee table books. The bulk of his commercial work involves architecture, interiors, gardens and food, featured in such publications as Jefferson’s Monticello by Howard Adams and From My Chateau Kitchen by Anne Willan. His art photography can be found in museums in Paris, London, New York, Chicago, New Orleans, and Jackson, Mississippi. He resides on the banks of Cassidy Bayou in the little Delta town of Sumner, Mississippi, with his wife, photographer Maude Schuyler Clay, and three mostly grown children; Anna, Schuyler, and Sophie. Remember….Support your Mississippi Delta Artists.